He is near…he is at hand! Jesus we wait,but please come Lord Jesus! We experience this longing for the coming of Christ. We long for the coming of Christ into our hearts as the Holy Spirit draws us into ever deepening relationship with Him; we also long for Christ in his Second Coming, when He will return physically to earth – as He promised – to restore all things to Himself. The wreath is a circle, which has no beginning or end: God is eternal, and His love for us is everlasting. The wreath is made of fresh plant material, because Christ came to give us new, everlasting life through His passion, death and resurrection. 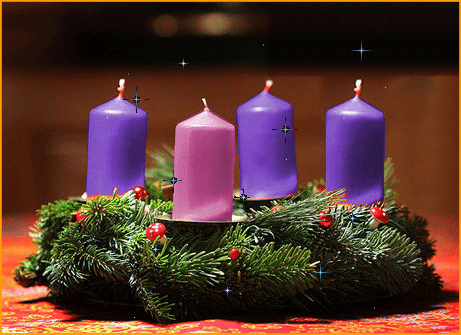 Three candles are purple, symbolizing penance, preparation and sacrifice; the pink candle symbolizes the same but highlights the third Sunday of Advent, Gaudete Sunday, when we rejoice because our preparation is now half-way finished and Christ will soon come. The light represents Christ, who entered this world to scatter the darkness of evil and show us the way of righteousness. The progression of lighting candles shows our increasing readiness to meet Our Lord. 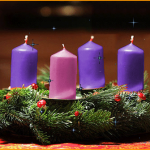 Advent is a time for penitential practices. Confession is an important part of preparing room for the coming of Christ into our hearts, that is, allowing Him to draw us into deeper conversion.